Sympathetic genre scenes, especially those including children, proliferated during the mid-nineteenth century in France, many times finding their inspiration in 17th century Dutch paintings. Artists combined the experience of the Realist painters and their depiction of scenes from every day life – without the occasional grittiness of their depictions – with the increasing interest in children to generate a series of charming images evoking the pleasant simplicity of rustic life. 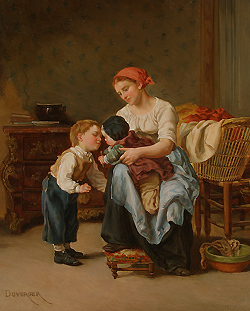 Théophile-Emmanuel Duverger, like Benjamin Eugene Fichel, contributed to this genre tradition, creating sentimental and nostalgic images that continue to retain their appeal for today’s audience. Théophile-Emmanuel Duverger was born in Bordeaux, France on September 17th, 1821. Duverger was an exceptionally unique character since he was an autodidact, skipping the formal training taking by many of his contemporary artists who also found success at the Parisian Salon. Instead, Duverger relied on his own artistic inclinations based on his experience with nature, especially during his time at Ecouen, as well as his understanding of other painters whose works he may have seen while visiting museums. This type of personal training had its benefits, since one could follow whatever path was desired, instead of being brought into the occasionally tumultuous world of the Parisian ateliers, where rivalries often ran rampant and occasionally polarized the art community. While Bordeaux did have its own art scene, Duverger relocated to the art colony of Ecouen, started by Pierre Edouard Frère, in the Seine-et-Oise region near Paris, where Duverger eventually found success at the Salon and later commissions. The Ecouen colony boasted a number of other artists including Auguste-Frederic-Albert Schenk, Jules-Jacques Veryrasset, Emile Lambinet, Emile-Louis Vernier, and Andre-Henri Dargelas, among several others. Duverger was actually the Dargelas’ father in law and their work shows many similar tendencies. 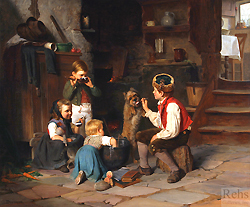 Duverger may have been inspired by Frère’s own compositions which also focused on depictions of the home, family, and especially children. Ecouen, just eight miles outside of Paris, was the perfect location for artists to retreat from the bustling city but also maintain close ties with it for the purposes of the Salon. Duverger began exhibiting at the Salon at a key time – 1846, even before the Salon was held in the Louvre and just two years before the 1848 Revolution during which time Parisians took to the streets in revolt against the corrupt government of the July Monarchy. Duverger’s images were far removed from the grim reality of the social and political scene in Paris at this time and instead focused on the cheerful nature of family life in rural France. But this imagery evolved only over time, and in his early years he began his public showings with portraiture. His debut painting at the Salon of 1846 was Portrait de Mlle. Z…D… (Portrait of Mademoiselle Z…D…). The painting of the worker and his children, by Mr. Duverger, is a composition that touches you profoundly. The worker, feeling that life is leaving him, brings together his children around his bed, and, holding out his hand to his oldest son, begs him to return to his duty. The child, with his head down, overwhelmed by the reproach, struggles internally against his negative bents, which he tries to dominate to promise a return to the better. But his wife, who is breast-feeding her last child, appears to doubt that there will be any change possible to her husband’s bad behavior. Duverger also submitted his work to the 1889 Exposition Universelle in Paris, where he received a bronze medal. In 1893 his work, L’Intempérance (Intemperance) crossed over to America where it was shown at the 1893 Columbian Exposition in Chicago. Duverger continued submitting his work to the Salon until 1898. Towards the end of his career, he, like many other artists began exhibiting drawings as well as paintings, but for his last work, Duverger exhibited the painting Allant aux Champs (Going to the Fields). Duverger showed a range of capabilities in his choice of imagery, ranging from the most well known cheerful scenes of domestic life, but also knew how to speak to a more aristocratic audience with works that concentrated on the luxury of idleness and the splendor of interior settings. While the date of his death is not specifically known, he must have died in 1901 since the Salon catalog of 1902 does not feature his name as an award winning artist who was still alive. Examples of his work can now be found in the Musée des Beaux Arts, Bordeaux; Le Musée Artistique et Archéologique, La Roche-sur-Yon, the London Guildhall Art Gallery, among other museums; private collections, and several galleries, as well.